First thing is first. My first giveaway winner has been chosen! Barb has won the two throw pillows and I've already sent her an email letting her know. Hoorah for Barb! Thank you to everyone that participated in the giveaway. I thought It was fun to host a giveaway and think I'll do another one soon. 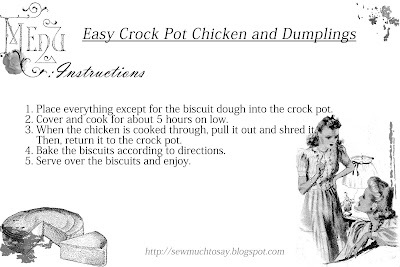 Next, I want to share an easy recipe for weeknight dinners. 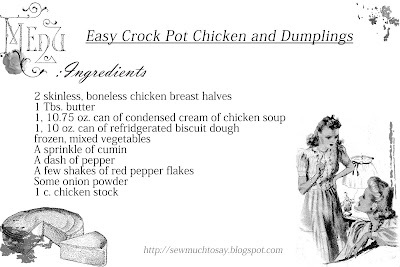 This simple twist on classic chicken and dumplings will be sure to feed your entire family and have them coming back for seconds. One of the things on my list of 40 things to do before I turn 20 is to have a candle lit dinner with Alec. We have a sit down dinner every night that we are both home and candles are sometimes involved. I just happened to photograph this occurrence with this dinner we had last week. Did I mention that this is so cheap to make? A complete perk for college kids like me trying to have nice dinners..or anyone trying to save money. Look how fluffy and delicious they turned out! It's as easy as that! Throw it all in when you go to work, eat it when you get back. The joy of crock pot cooking cannot be described. Now here is the recipe! I have spent hours (and I mean hours) trying to figure out how to make these recipe cards for you! I know I usually post my recipes along with the pictures as I go, but you guys want to cook this. You don't want to drool over it on the computer. Well, maybe you do. Anyway, now you can drool over the pictures and then click on the recipe cards and print them! Now you can have this recipe for your recipe box so that you can actually make them for your family. Just click on the pictures and print them. No jotting down the recipe in a rush or trying to scroll through this blog post as you cook. Please let me know if you try this recipe! For a moment, I thought you were giving away a candle lit dinner with Alec.